Heel leuk hostel, zeker aan te raden! Goede sfeer, nette kamers, goede bedden, aardig personeel en alles wat je nodig hebt is er te vinden, zoals een keuken/kluisjes/wasservice (behalve olijfolie haha). Ook hebben ze 2 grote gemeenschappelijke ruimtes, waar je makkelijk anderen ontmoet. Het ligt in de El Poblado buurt (veilige uitgaansbuurt) waar de meeste hostels liggen. Het is ongeveer 20 minuten lopen naar de metro toe. Erg leuke tijd gehad in dit hostel! Good beds. Clean showers. They also have a private bathroom, which is really spacious. The shared showers were small cabins. Nice personell. Good breakfast. Nice neighbourhood. 15 min walk to metro station. It was a nice and friendly place. Perfect location in a safe an touristic neighborhood. In the night it can be really noisy from the garden in the front of the building. The walls of the room aren’t thick enough to handle this amount of noise... that is the only thing I could complain about. Had a lovely stay mostly because of the friendly staff and good breakfast! Nice, clean and social hostel at a good location and with a decent outside terrace. Only downside was that the bed gave me a bit of a backache. It might just have been my bed, though. It seemed to be the only bed of which the matress was tilted to one side. I heard nobody else complain about this. 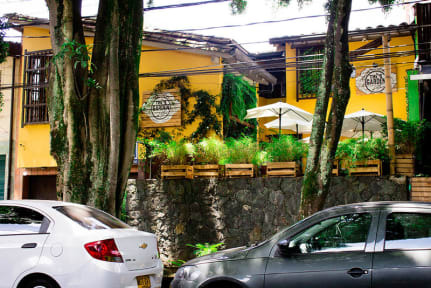 The location is great; just on the outskirts of El Poblado. Walking to the metro is about 20 minutes. The area is very secure. The breakfast is not too impressive to be honest. It was overall a nice hostel -clean, cosy, good brakfast- but I was really not happy about the front desk staff of this hostel. They gave us a lot of wrong information, regarding foot ball tickets, bus stops, bus schedules etc. They lost one of my favourite shirts in the laundry and were not helpful at all when I wanted to get it back. The PE tour that the hostel recommended was a huge rip-off. And when I finally ended my stay they were trying to overcharge me for something I didn't have. 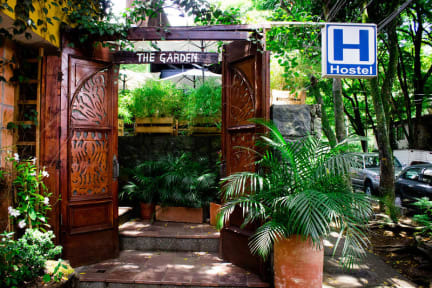 The hostel is located near to the bars from Poblado. Breakfast is nothing special and the lady that serves is rude. Small kitchen, which is ok. In my opinion there should be more Bathrooms. The showers were awfull. It turns from boiling water to icecold, not enough pressure to wash my hair. They call theirself garden of blues, but they didn't play any music. Beds were good and they made them every day. We booked two beds in a dorm room and our room was located in a different building on the same street. This wasn’t very pleasant because our room + common area were very small. The breakfast was bad: we got a cold arepa, a cold baked egg, some bread, a cookie and a banana: not worth the money. Wouldn’t recommend this hostel.